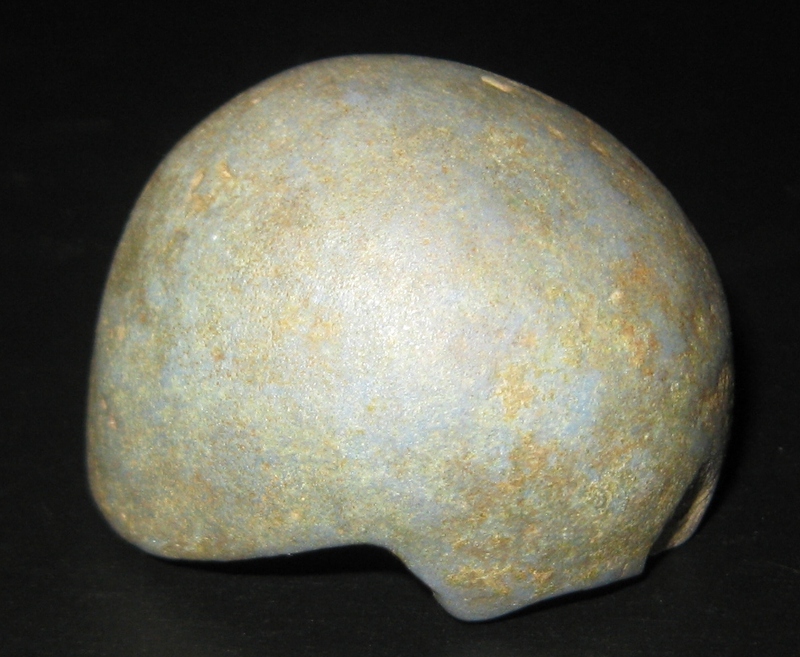 One of the more extraordinary objects offered on our website is a Late Dynastic Egyptian blue skullcap detached from a statuette of the god Ptah. It may be viewed here: http://www.clioancientart.com/catalog/i11.html. We have described this antiquity as being made of “frit” — a term sometimes but erroneously used interchangeably for faience. But why did we choose this term? What is meant by the term “fit: and is this really the same material as faience? We will examine here some characteristics of Egyptian faience, its production techniques and the range of materials that are broadly referred to as faience in relation to our object, which may well be a rather unusual variant. 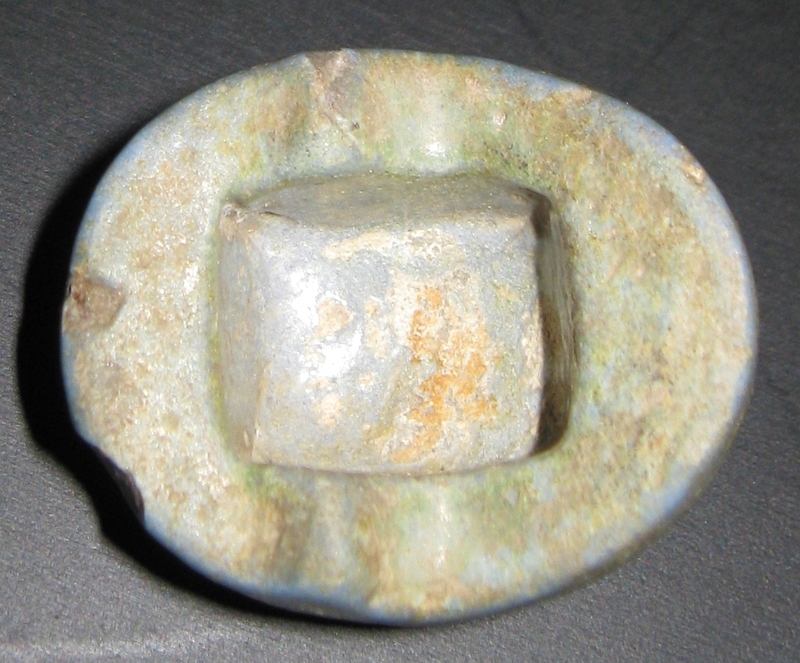 Faience, which the Egyptians called tjehnet (meaning brilliant or shining) may have been developed as an alternative to lapis, an expensive deep blue stone whose main source was distant Afghanistan. Whatever the motivation, faience production began as early as 5000 BCE and continued through the late Roman period around 350 CE. Early faience involved simple glazing of stone objects such as beads. The primary component of faience was a readily available material, quartz. This was ground to powder and mixed with calcium oxide and natron (a type of salt commonly found in the Egyptian desert) and possibly other materials, including metallic oxides to provide coloring. Faience could be used to glaze other materials, such as soapstone, and later to create finished objects by pressing the mixture into molds. Some faience was “self-glazing” in that a hard shiny surface layer of salts would form on an object’s surface through efflorescence. Faience was fired in kilns at relatively high temperatures, up to 1000 degrees Centigrade. Egyptian artisans combined long established skills and technologies from pottery making and metallurgy to perfect their craft. In the early New Kingdom, with the probable arrival of glass artisans from Mesopotamia, a new component was added to this skill set, and a number of variants on the basic formula emerged. These included frit, also known as Egyptian Blue, which had much in common with glass making, and so-called “glassy faience”. This is where our skullcap of Ptah comes in. reveals two several unusual aspects. In the deeply recessed and therefore protected interior underside, which would have rested atop the statuette’s head, a shiny glass-like surface is revealed. Shiny examples of glassy faience are known to exist. Also, in two spots there are small breaks along the object’s edge that have fractured in a manner very much resembling flint or volcanic glass. Finally, the chips mentioned above reveal the interior of the object to be identical to that of the exterior, with no thin outer layer of efflorescence or glaze differing from the interior composition. This gives it more in common with blue frit than ordinary faience. In the end, only a chemical analysis of our object will provide a more complete answer. However we might classify this material, the object itself is highly unusual. * Gifts of the Nile, Ancient Egyptian Faience, Florence Dunn Friedman, Editor, with four examples of wigs and crowns from composite statuettes, and inlays in the form of wigs, dating from the New Kingdom and 3rd Intermediate Periods, pages 82-83 (we highly recommend this excellent book). * Stern & Schlick-Nolte, Early Glass of the Ancient World, 1600 BC – AD 50, Ernesto Wolf Collection, No. 26, for a small Egyptian male head, probably 10th-7th Century BC, made of “vitreous material” remarkably similar in color and texture. * Lacovara, Trope & D’Auria, editors, The Collector’s Eye: Masterpieces of Egyptian Art from the Thalassic Collection, Ltd., Michael C. Carlos Museum, Atlanta, 2001, #29 for a large skullcap of Ptah in bright blue faience, as an inlay, dated to the New Kingdom. Previous Post WHAT CAN WE LEARN FROM A BUCKLE?